See the North Hartland Lake website for additional information. Primary recreational opportunities are listed below. Directions: From White River Junction, 5 miles south on US 5. Take a right onto Clay Hill Road. Factoid: At the upper end of the reservoir, the Ottauquechee River flows through the sheer-faced 165-ft deep Quechee Gorge, one of the outstanding natural spectacles in the state. An overlook area and a state-managed campground as well as a new Visitor Center opening in the summer of 2005 are nearby. At North Hartland Lake, there is boating on the 215-acre lake, picnicking in a wooded picnic area, grills, playground, play field, horseshoe pits, volleyball nets, nature trail and a small beach offering swimming. 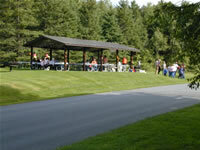 There are three picnic shelters at North Hartland Lake that can be reserved for a group event for a nominal fee. The trash policy for the park is carry in/carry out. For up-to-date information, call (802) 295-2855.